Cross-laminated timber (CLT) is a solid engineered wood product which is rapidly gaining popularity in residential and non-residential applications. Owing to its properties CLT is proving to be a highly advantageous alternative to conventional materials like concrete, masonry or steel. CLT panels are strong, stiff, light weight, fire and thermal resistant and generate almost no waste on site which allows them to be used in a wide range of applications. Its dimensional stability and structural properties make it a suitable choice for floors, walls and roofs. As it is prefabricated, it can be easily and efficiently installed which saves the construction time. It can be used solely for an entire building or can be combined with other building materials, thereby, facilitating flexibility in design and style. Moreover, it is an environmentally preferable choice as it is renewable, sustainable and emits less greenhouse gases. It outperforms conventional building materials in terms of carbon footprint, energy dissipation, embodied energy, and air and water pollution. 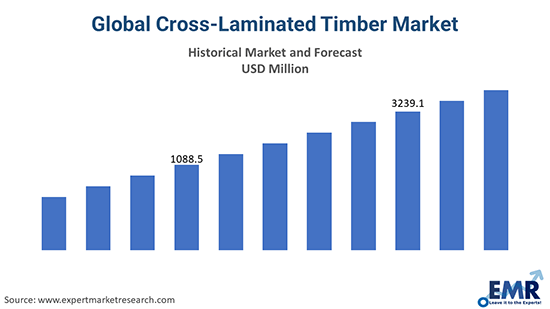 According to a new report by Expert Market Research, the global cross-laminated timber market reached a production volume of 1.0 Million Cubic Metres in 2018 and is further expected to reach 1.6 Million Cubic Metres by 2024. One of the major factors driving the growth of the market has been the revisions in the International Building Code 2015 which have allowed the use of CLT for high-rise buildings. Some of the factors which are anticipated to influence the market growth include growing awareness, improved marketing and effective distribution channels, reduced building costs, and rising demands for improved and energy-efficient building materials. Region-wise, Europe dominated the market with a major share of the total global production in 2018. It was followed by North America and Others. Being fragmented in nature, the global cross laminated timber market is surrounded by a number of players. Some of these players include Stora Enso, KLH, Binderholz, Mayr Melnhof, Hasslacher, Merk Timber, Lignotrend, Eugen Decker, Schilliger Holz, WUJ Derix.